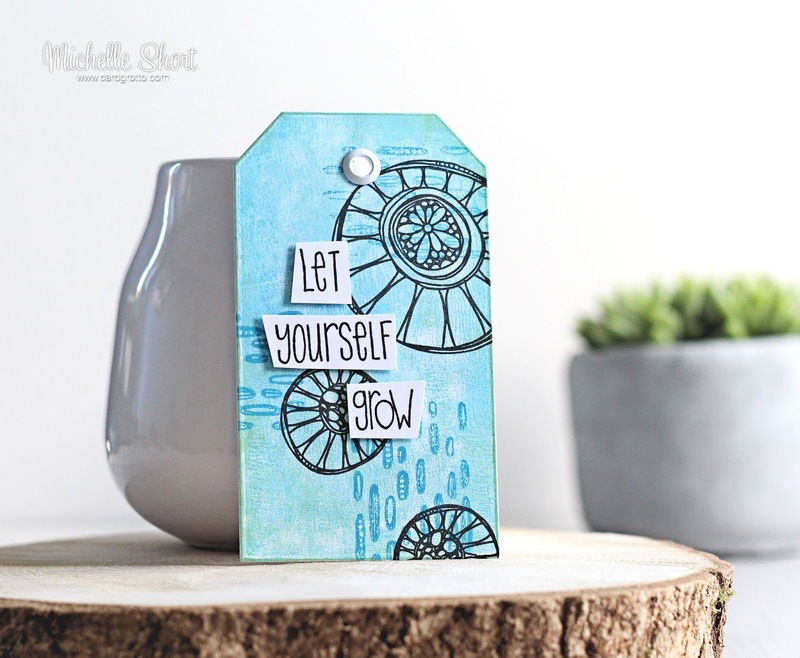 Hello there, I am back with my final projects using the new release by Kim Dellow for PaperArtsy. 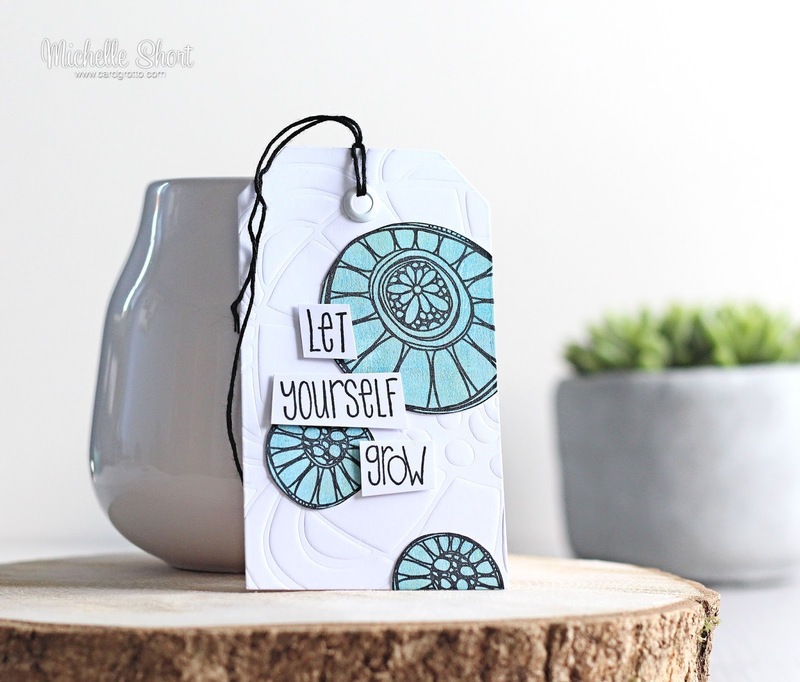 Today I have two tags to share using a combination of a few of the stamp sets, the stencils and Fresco Finish Paints. For both of the tags, I started off by cutting two tags from white cardstock using an MFT Traditional Tag Stax Die. For the first tag, I ran the tag through my Cuttlebug and embossed it with the PS046 stencil. I then took some white cardstock and added layers of Fresco Finish Paints to it using a mini brayer. I used Blue Oyster, China, Limelight and Snowflake paints. The round flower images from the EKD06 stamp set were stamped over the top using Archival ink. These were then cut out and adhered to the tag with tape runner. the sentiment, from the older EKD01 set was stamped, cut out and added to the tag with foam tape. To finish off, I added an eyelet to the top of the tag, as well as some black floss. For the second tag, I used the paints and brayer technique again but this time with the whole tag. The round flower images were stamped with Black Soot Archival Ink on top. I then took the background type image from the EKD05 set and stamped this using the China Fresco Finish Paint. I used the same sentiment as on the first and again, added this with foam tape. To finish off, I added a white eyelet to the top of the tag. The first tag is more my normal style I guess, but I like how the second one came out too and I will definitely be using the brayer technique with the paints again. For more information on the release, please head over to the PaperArtsy Blog. I hope you have enjoyed seeing all my projects using it. Thanks so much for visiting me today. I hope you have a great weekend! These are wonderful tags Michelle! Great tags Michelle, I am enjoying some of the new styles you are embracing with your new Design team work. I just love these. The way you have layered them and matched them is perfect! Totally adore! These are cute tags! I love them both but I think the white embossed one is just in the lead that little bit more!